Remove heavy imperfections safely and easily! Hex-logic technology creates a strong pad that stays cool while running! 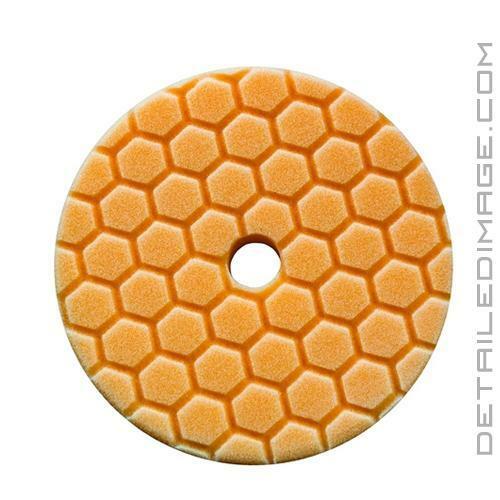 The Chemical Guys Hex-Logic Quantum Buffing Pad Orange will help you remove noticeable imperfections safely! Imperfections, swirls, scratches, etc. can really take away from the overall look of an otherwise beautiful vehicle. We always recommend starting with a light polish first and inspecting the results. However, if the light pad and polish are not working you have heavy imperfections and need more corrective power, this orange pad could be exactly what you are looking for. Pair this pad with your favorite compound or more aggressive polish and you will be impressed by how quickly and effortlessly you remove swirls, light scratches, oxidation, etc. This pad is the second strongest corrective pad in the Quantum line, but if you find yourself needing something even stronger, the Chemical Guys Hex-Logic Quantum Buffing Pad Yellow (listed below) is a great choice. Once finished, we do recommend following up with a lighter polish and pad combo to remove any haze left behind. I've had great success with the Hexlogic pads in the past and noticed these newer quantum pads. I noticed the older ones worked great but sometimes i'd get a bit of marring left over and I figured it was due to the center of the pad. The hole seems to make a difference for me as well as keeping the pad cooler. Great pads. They work for what they are needed for! Not enough difference between this and the white, in my view. I'd get yellow next time instead for cut polish.